There are several annual race meetings held at Cheltenham Racecourse, the highlight being the Cheltenham Festival in March, when the world-famous Cheltenham Gold Cup takes place. 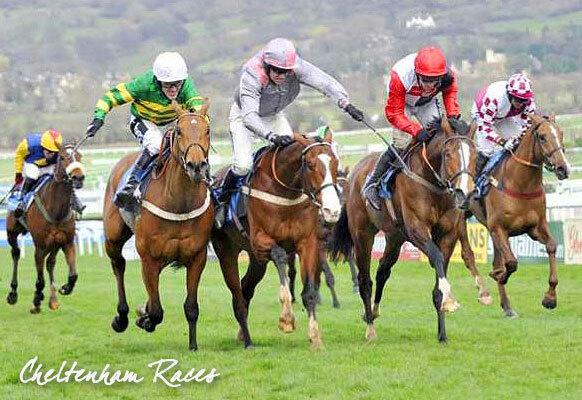 Cheltenham Gold Cup is the world’s largest steeplechase meeting, with prize money exceeding £575,000. The most prestigious of National Hunt events, the Gold Cup is run over 3 miles 2½ furlongs (5,331m), and 22 fences, and attracts more than 260,000 visitors each year. While 24 The Promenade is within walking distance of the Cheltenham Racecourse, you’ll need to plan ahead – the apartment is already booked for Gold Cup week until 2019. If culture is more your thing, you’ve come to the right place. Cheltenham is well known for its annual festivals, which attract hundreds of thousands of visitors to the town each year. 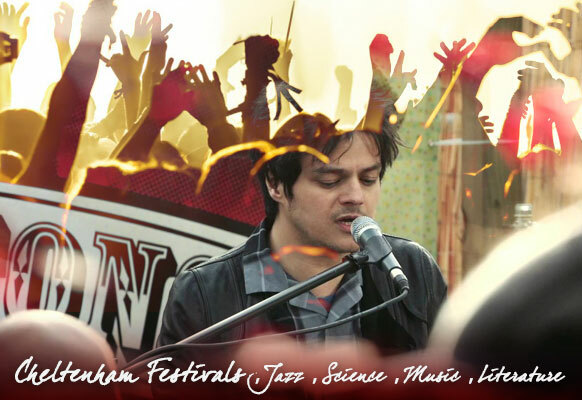 For information on Cheltenham’s festivals of jazz, science, literature and music, visit the Cheltenham Festivals website . Information on the Cheltenham Food and Drink Festival can be found here. Cheltenham became famous originally because of its waters, which were believed to have great healing powers – hence the name, Cheltenham Spa. Visitors flocked to the town, and numerous spas and entertainment centres were built to cater for their needs. Pittville Pump Room – now a Grade I listed building – was the last and largest of the spa buildings to be built in Cheltenham between 1825 and 1830 by the architect John Forbes. It housed a ballroom on the ground floor, and columns supporting a gallery under a dome from which music can be played. Other floors hold a billiard room, library and reading room. Pittville Pump Room was built on land owned by Joseph Pitt, who gave the area the name by which we know it today – Pittville Park. The well from which it obtained its water formed the centrepiece of a pleasure garden – the popularity of which grew after a visit from King George III in 1788. 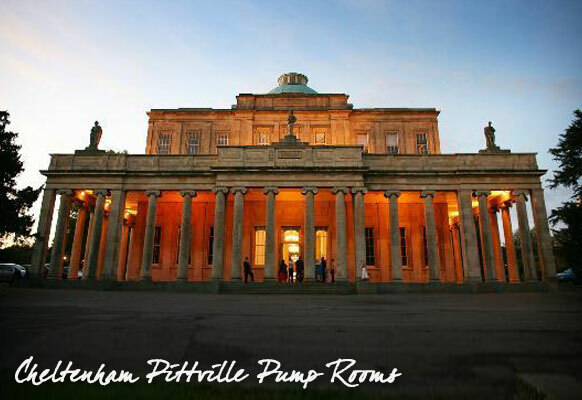 Today, Pittville Pump Room is used as a concert hall – particularly during the Cheltenham Music Festival – and as a venue for weddings and events. Open May to October, Sandford Parks Lido is an Olympic-sized outdoor, heated swimming pool, built in 1935 on land originally owned by Cheltenham College. Despite a number of challenges involved in building the lido, it quickly became a great success, attracting over a hundred thousand visitors a year. 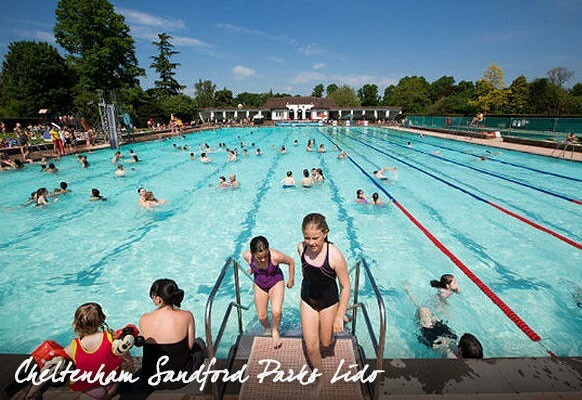 Today, Sandford Parks Lido is run by a charitable trust, and it remains a popular attraction – particularly during the warm summer months, when it often plays host to events such as film screenings and outdoor theatre. Fifty meters long and ten lanes wide, the pool holds 500,000 gallons of water, heated to 21 degrees centigrade, and its landscaped areas and café make it the perfect place to combine exercise and relaxation. Situated near Winchcombe, and built in the 15th century on the site of a 12th century castle, Sudeley Castle is steeped in history. One of the few remaining castles in England that’s still a residence, Sudeley is only open to the public on set dates, and private family quarters are closed to the public. In March 2014, the castle opened up more private rooms, including some that have never previously been open to the public. 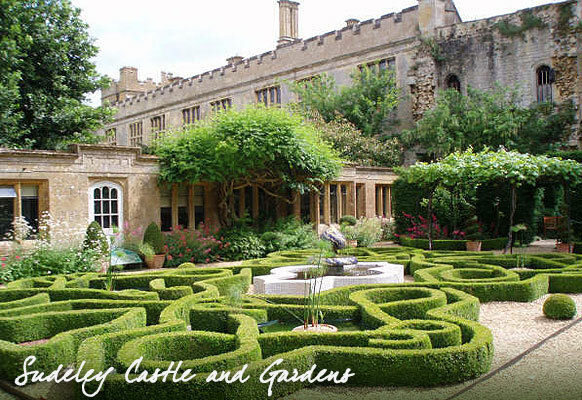 Sudeley Castle is a Grade I listed building that’s recognised as an internationally important structure. You’ll even find a marble tomb where the sixth wife of King Henry VIII, Queen Catherine Parr, is buried. 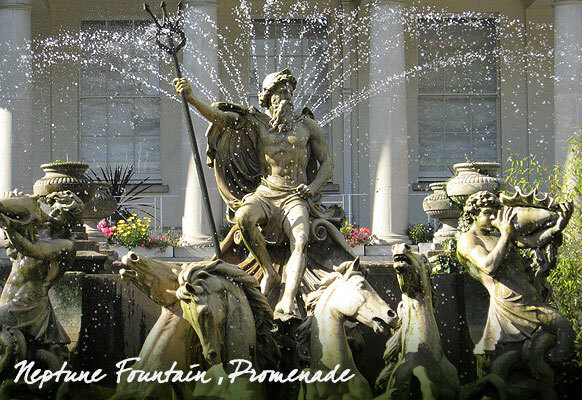 Situated on Cheltenham Promenade, the Neptune Fountain was copied from the work by Bartolomeo Ammannati in Florence, where it resides in the Piazza della Signoria, in front of the Palazzo Vecchio. Cheltenham’s statue was commissioned to mark the wedding of Francesco I de' Medici with Grand Duchess Johanna of Austria in 1565. The Neptune figure stands on a high pedestal, decorated with the mythical chained figures of Scylla and Charybdis, in the middle of an octagonal fountain. The Wilson, Cheltenham’s art gallery and museum, is a short walk from the centre of Cheltenham, and hosts many excellent exhibitions and events. 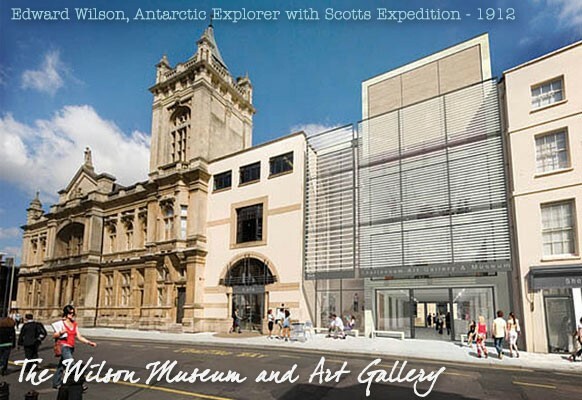 The venue is named after Edward Wilson a polar explorer, natural historian, painter and ornithologist who accompanied Scott on his ill-fated attempt to reach to South Pole in 1912. Wilson was born in Cheltenham in 1872. If you look carefully, you may spot the blue plaque on the home in which he was born in Montpellier Terrace. 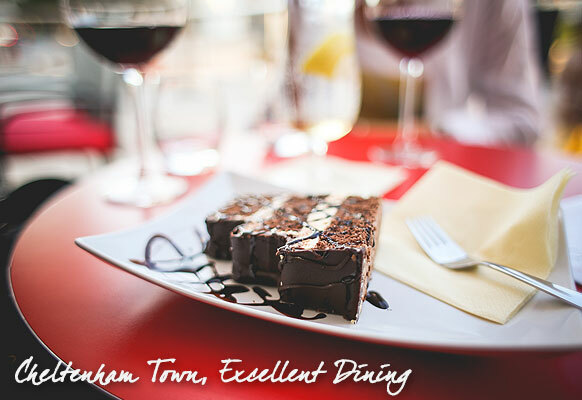 With 335 restaurants to choose from, Cheltenham offers a huge range for all tastes – quite literally! From renowned Michelin-starred restaurants such as Le Champignon Sauvage to award-winning fish and chip shop, Simpsons, you’re spoilt for choice. Check out TripAdvisor for reviews and ratings to help you narrow down your selection. 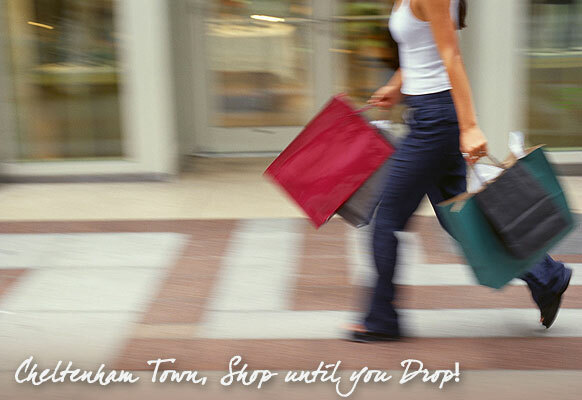 The word ‘shopping’ either gives you a tingle of pleasure or fills you with dread! If it’s the former, you’re in luck – Cheltenham has an excellent range of shops, from charming one-off boutiques and high-street chains to modern department stores. Our apartment may be lovely, but it doesn't have a garden! 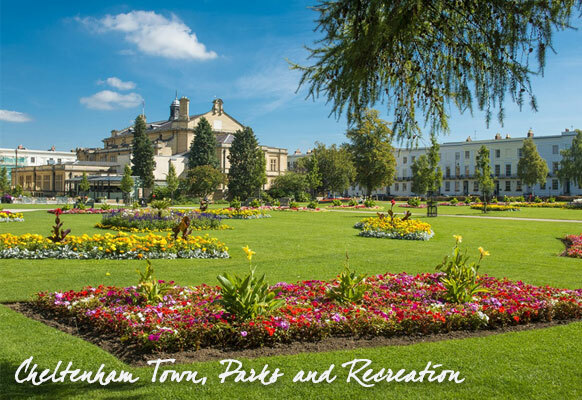 No problem – Cheltenham has a choice of beautifully maintained parks and green spaces to enjoy, from the Imperial Gardens with its popular bar, to Pittville Park (home of Pittville Pump Room) and Sandford Park (home to Sandford Parks Lido). Simply take your lightweight deckchair (supplied) to the nearest park (Imperial Gardens, pictured above, is around 200 metres away) and enjoy! Looks like hard work to me – but each to their own! 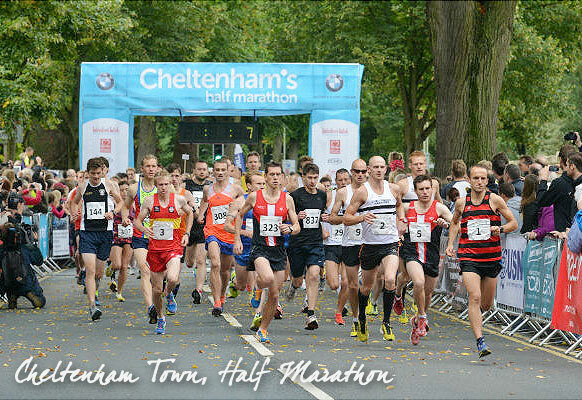 Cheltenham’s popular half marathon attracts thousands of visitors each September, and makes a great spectacle – whether you prefer to take part or watch from one of the town’s popular parks or bars.